Making the world safe for sin. Sounds like a devious title, I suppose. I admit I intend to be provocative, but point is that we dream of doing such a thing. We know that to sin is wrong, but we each dread giving up our sins. Until we begin to learn wisdom, we would much rather sin. How would we make the world safe for sin? We cannot. We can only shut up the people who point out our sins. How do we do that? Well, Multiculturalism is one way. Differing World Views: What Is Multiculturalism? Tony and I have been having a debate. In response to his comments at this post, IF WE ARE ALL BIGOTS, WHAT KIND OF GOVERNMENT SHOULD WE HAVE?, I wrote this post (outlined here). Why do we have such differing worldviews today? Many people want to believe in Multiculturalism. Multiculturalism is the religious belief that all religious beliefs are equally valid. What Multiculturalism does is turn multicultural into an “ism” by making a multicultural society desirable FOR ITS OWN SAKE. Therefore, we must become tolerant to the point of the ridiculous and beyond. Even though Multiculturalism is absurdly illogical (THE MYTH OF TOLERANCE), our elites both preach and enforce the doctrine of Multiculturalism. Hence, I have felt the need to complain. Here are a few examples. What happens when I and others denounce Multiculturalism. I talked about that in WHY ARE POLITICS AND RELIGION LOST SUBJECTS IN AMERICA? Why don’t we discuss politics and religion? Well, it seems the problem is we don’t want to be perceived as having a bias. Some people, perhaps those sneaky conspirators, have us convinced that anyone with a bias is BIGOTED, not objective or neutral. Multiculturalism is a scare tactic designed to silence opposition. We are suppose to gush with love for everyone and be completely nonjudgmental. Multiculturalism works because when we send our children to a public school their teachers indoctrinate them in Multiculturalism. Then they are surprised when they have discipline issues. WHY DO CHILDREN NEED A RELIGIOUS EDUCATION? So should we put our government in the business of teaching the Bible? As I said here, THE MORALITY OF GOVERNMENT, that would not be a good idea. People who do not believe what the Bible says cannot be trusted to teach it, especially to children. In addition, there are constitutional issues. If you have children, the public school system is nearly a lost cause. It gives politicians (especially the Democratic Party) too many opportunities sell their donors the “right” to indoctrinate other people’s children. It may take a village to raise a child, but that village is composed of family, friends and neighbors, not politicians and bureaucrats in your state capital or Washington, D.C. Some years back I wrote DEISM AND THE FOUNDING FATHERS. In that post, I strove to show that even the supposed Deists had a Christian outlook. Even those who had doubts about the Bible admired its wisdom. Hence, these words found their way into our nation’s founding document, the Declaration of Independence. Why those words? Well, the Founders were not into Multiculturalism. Yet does the meaning of those words seem obvious? Then why has the power of our government grown so great? Did you know that the pursuit of happiness is the pursuit of virtue? The Founders recognized the each of us has the right to pursue virtue in his own way, that each of us has the right to aspire to the best beliefs, not beliefs dictated by the state. It has been 240 years since the crafting of those words. We don’t educate our children the same way the men who wrote those words, signed their names to those words, and fought for the ideas represented by those words were educated. Few spend many hours reading the Bible. Fewer still spend much time delving into writings of the ancient Greeks and Romans. We study history through textbooks. We don’t read the literature of the periods we study. So we have a difficult time understanding the thoughts of those who went before us. The lost is incalculable. When we don’t take the time or even make the effort to understand why previous generations believed what they believed and governed themselves as they did, then we repeat history’s disasters. Then we can only hope to learn from our own mistakes. Can We Appoint Government To Love In Our Place? Can we appoint government to love in our place? Can we love our neighbors through our government? No. 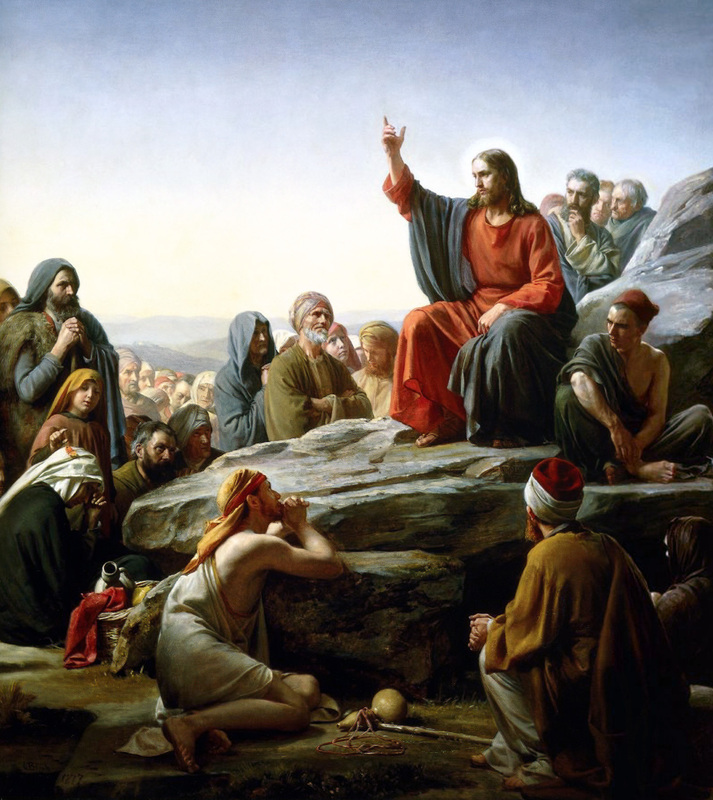 The Sermon On The Mount (Matthew 5-7) records what Jesus taught His disciples as they sat on a mountain over two thousand years ago. Imagine how the religious leaders reacted to these words. When He spoke of love, Jesus spoke of a personal act and of personal sacrifice. Jesus did not speak of legalistic formulas. He spoke of obeying the commandments of God in the spirit with which God gave them to us. Hence, the legalistic righteousness of the scribes and Pharisees was not enough. Too often they put on a show of obeying God’s Law, but they did not love God, and they did not love their neighbors. Instead, they loved the acclaim of men. We cannot rightly say we are charitable because we pay our taxes. We rightly cannot say we are charitable because we make the “rich” pay their “fair share”. At one time I thought I could rightly say such things, but then I realized I was no better than one of those Pharisees Jesus called hypocrites. When we consider of the morality of taxes, we must consider how the money will be used. As the Declaration of Independence insists, government exists to protect our rights. When we tax our neighbors so as to force them to be charitable (i.e., redistribute the wealth) we commit two sins. We tempt our public officials with too much power. We make the same people responsible for both protecting our property rights and giving us other people’s property. Inevitably, some of them abuse this power by buying our votes. Consider the fact that for decades the news media has referred to Social Security as the third rail of politics. Why? It is well known that old people vote, and, sadly many of those old people will vote to protect Social Security, even though the system is designed to steal money from the young and give it to the old. Why the wealth transfer? The politicians running the program spend the “excess funds”. The so-called “Trust” Fund is empty. Thus, the lie we call Social Security encourages parents to vote to rob their own children and grandchildren. Has The American Experiment Failed? In the comment that generated this post, Tony suggested an experiment. I don’t see much point in adding to what I said in my comment here. Instead, I think this is a good time to remember that in 1776 America began a great experiment. With the ratification of the Constitution, America formed a republic, one designed around a new idea, the protection of each individual’s God-given rights. Consider why some people detest individualism, especially rugged individualism. The notion of God-given rights gives the individual both the power and the responsibility to live as he believes God would have him live. Thus, the individual must choose what he owes to God and the collective (i.e., the state) (Matthew 22:21). Those who insist upon empowering the collective insist the state must define our rights, not God. These may worship the appearance of diversity, but they crave a uniformity of thought. These would substitute the ignorant mind of a man for the mind of God. We must remember that God is our Master, and He is also our Judge. If we limit the power and size of our government to its constitutional functions, some men, left to their own devices, will piggishly horde their wealth and refuse to help the needy. Yet those who do choose to help will be more effective, and the needy will be more appreciative and desirous of helping others as they have been helped. You often say here that one cannot know Christianity unless they find revelation through reading and studying scripture, and unless they through grace have been redeemed in Christ. I think that you might also consider it slanderous if someone were to condemn Christianity on no more than just hearsay and the horrible things people say we have done in the name of Jesus. (Some devout atheists have made their reputations on such scurrilous slander of Christianity). And no, I am no more qualified to defend Islam than you are to demonized it. The question we should ask ourselves is not whether we have a “right” to condemn someone else’s religion as inherently evil (we do), it is whether we really have the knowledge and expertise of the various theologies and numerous denominations of Islam for it to be “right” to do it. But that is still not the more important question that I have asked. Even if we were to accept what you say about the inherent bellicose nature of Islam as true fact, is it the whole truth about this vast religion, or is it a one truth about a very complex and varied theology, a convenient reductionism, especially if used to justify persecution? And still more importantly, even if we were accept the view that Islam is an inherently violent and conquering religion, what do we do with that truth? Do we violate the Constitution with religious tests for immigration? For travel visas? Even for American citizens to stay in the country? Hold government jobs? Run for office? Do we violate our basic values of pluralism and tolerance for religious beliefs that we don’t agree with? Do we become what we would condemn in Islam? And finally, what are the practical consequences to trade and strategic alliances? What does a wholesale condemnation of Islam do to our service personnel? These are not unreasonable questions. I’m not saying that we don’t have a right to believe Christianity (or even our particular denomination of Christianity) is the exclusive path to God, and to goodnaturedly argue, cajole and persuade each of that belief all day long. Americans have been doing that since we have been a country. But isn’t there a difference between advancing the exclusivity of the good of my religion and demonizing another religion? More importantly, can’t we see that there is a difference in having and vocalizing such strong personal or religious opinions about the Muslim religion and, on the other hand, using the power and office of government to discriminate against that religion? I’m not trying to mischaracterize or condemn your position. I’m trying to figure it out and ask you to morally and constitutionally justify it if you can. I also know that many people share in having some of these opinions Tom. In the wake of the genuine threat from the radical elements of Islam, people ligitimately fear for their safety. I don’t discount that, but does this fear, this risk, genuinely justify tearing up the Constitution and many of our most sacred values? Please do not feel that this is an attack. I’m not outraged; I’m a bit mystified and genuinely concerned for where this ultimately leads our country. Can you even understand that concern? Please let’s not deflect with irrelevant platitudes and with hyperbolic charges and attacks. None of us learn anything from either of us playing the hurt victim or from an angry shouting match where we all talk past each other. That’s not what I’m doing or intending here so I respectfully ask that you not do the same. For the most part what you call the Reformation Wars were bloody affairs, but they had more to do with politics than religion. Consider why King Henry formed the Church of England. He just wanted a divorce. That led in part to the formation of the Spanish Armada, definitely one of those Reformation Wars. Can you cannot find anything in the Bible to justify warfare over religion. Does the history of the early church contains nothing to support such a thing. That is why John Locke’s letter had so much influence. He just said what people who had read the Bible already knew. Because the Bible is so against aggressive warfare, we even have pacifists who justify their pacifism by pointing to the teachings and the example of Jesus. Christianity is caught. No one can be forced to be Christian. Yet people will be people. We will call ourselves one thing and then be something else. No one save Christ is a perfect Christian. That’s why I try to avoid the word “I”. I am not perfect, and when I make it about me, I already know I am wrong. What about Islam? Like Christianity, Islam is an ideology. Ideologies are about ideas. We can examine ideas and evaluate them. Multiculturalism, tolerance taken to an absurd extreme, is just a stupid excuse for not doing that. Most of what calls itself Islam is something the Pharisees would have understood. It is based upon salvation by works and legalistic. Unlike what the Pharisee taught, however, Islam is a warlike religion. Muslims spread Islam with the scimitar, and its founder was the first to spread it that way. Are you accusing Muḥammad of not understanding Islam? When you protest that I am “slandering Islam”, you are basically saying Muḥammad did not know how a good Muslim should behave. Consider => https://citizentom.com/2015/12/20/why-are-we-afraid-to-discuss-islam/. The centerpiece of the post is a video that slams home its point with statistics. Statistics can be misleading, but they can also be very interesting. Does a dislike for Islam mean we must hate Muslims? No. We can wish they were Christians, but we cannot make anyone become a Christian. You mentioned the Constitution. The Constitution gives Congress complete power over the procedures for naturalization. After a Muslim is a citizen, he has first amendment rights. Why does it have to be more complicated than what the Constitution actually says? To be a Christian, one must admit the need for a savior. Each Christian must admit his sinfulness and repent. Hence, when I consider the need for a government and the potential for abuses of power — the temptations for both the people and their leaders — I see the wisdom in limited government. Moreover, when I see that becoming a Christian is a choice that cannot be coerced, I understand the need for freedom of religion, including religious expression. You don’t entirely agree? Well, God made us all, and we are all part of His plan. I am slandering Islam? I am way too late. Check out how its founder spread his religion. Normally, when someone has to resort to such emotionally dismissive hyperbole, rather than respond to ethics with ethics, logic with logic, I assume that they have run the natural course of an empty argument. This is saddening. If you don’t want to actually defend your positions and counter another person’s ethical and practical proposals with positive assertions and countering statements of your own, why do you even put these articles out here? Aren’t you asking your readers to challenge and correct your errors? Again, that is just a honest question. Rhetoric is fine, but you are too smart to not realize what caustic rhetoric alone unbridled by any moral reason or practicality amounts to without me saying it. Do you really want to slander the religion of over a billion persons including many patriotic Americans as inherently evil and violent? That’s an amazing accusation in and of itself, but even assuming these assertions were true (or even partly true), and you were informationally equipped to somehow prove them, what on Earth do you propose to do about it practically and without essentially violating our Constitution and our basic historical values of religious liberty and freedom of conscience in the process? What “religious test” would you impose? What laws would you make that would impede the free and lawful exercise of the Muslim religion? And how far does this go? Christianity and Judiasm, in some forms and times, has exhibited a certain disdainful belligerency and bellicosity (as you yourself seem to proudly exemplify). For most of Christian history Christian Churches (yes, mostly the Catholic Church, but as Protestant religions took over, they did so as well) sought coersively to control the state. Do we ban those beliefs as well? How is it even practically workable to ban a thought, a belief without becoming an Orwellian dystopia in the process? These are not accusatory questions either – they are practical and ethical ones which naturally rise out of your own broad assertions. Dear brother, I’m just as stubborn as you are, but I will grudgingly admit that, after a good deal of thought and study, I have come closer to your way of thinking as far as the rational proof of God goes, and especially that rational disproofs of God can only end up resorting to their own kind of flawed, superstitious faith. In other words, you have changed my mind by some of your best arguments. If you can’t defend some of these more aggressive assertions with your own good Christian heart and your own highly rational intellect, but only with bile filled dismissal, then respectfully, and with love and concern, maybe you might humbly consider rethinking them. Here is as good a place to start as any. Tom – your tendency toward distortive exaggeration of other people’s views seems to get worse with time, rather than better. It has become very predictable for you to take a point and contort it into something that no rational person would agree with and then go after it, rather than the point actually made. I have never heard any politician or elected official advocate for “open borders”. That’s a chimera devised by political manipulators intended to alarm low-information voters. The immigration issue that we do really face is to try to find ways to control immigration in a manner that best serves our economic and security interests. We do this against a backdrop of the economic reality that immigration has been extremely beneficial to our country over history, including in recent times, but with the additional reality that we are in a world security situation that requires increased attention to screening of individuals. As the world economy becomes more complex and competitive, there is also a good case, as Tony suggests through example, for measures that actively encourage immigration (and retention of students at the university level) of engineers, medical researchers, computer whizzes and other key sectors. We are competing globally for skill. We need to do whatever it takes to bring in the best and brightest, and that may entail selective streamlining of the overall immigration system. From top to bottom of the immigration spectrum, we need to find ways to un-clog the system, to remove incentives to avoid legal entry, and to ensure that we have systems for detecting people who come here to commit violence. This will require comprehensive immigration law reform, and one hears very little from our politicians about attacking these very real issues. It benefits America to encourage hordes of poor people to come to our nation so that they get on the dole and get their children a free education in the public schools? Obviously, you think that whatever politicians call an investment is a good investment for America. You have yet to figure out that they are investing our money in their next reelection campaign. Thank you for your prompt validation of my sense that you are given to gross distortion of other commenters’ statements. No, it doesn’t benefit America “to encourage hordes of poor people to come to our nation so that they get on the dole and get their children a free education in the public schools”. Did anyone actually say that? Nope. You made that up. No, I don’t think (“obviously” or otherwise) that “whatever politicians cal an investment is a good investment for America.” In fact, my comments have pretty squarely placed me as saying that I have a significant degree of distrust of much of the current political discourse. I look forward to your substantive, real world response to my 0720 comment. Rest assured I will reply with all the seriousness your comments deserve. Aristotle was a pre-Christian pagan. He taught about virtue. People of all places and times honored universal virtues. Although, my belief in virtue is Christian, the Aritotilian Aquinas taught that one could make a metaphysic case for virtue from natural logic without making it to God or religion (but he also thought that it would not be as complete). Anyway, I am not “forcing” the honor of virtue on anyone. I’m just saying that we might look at judging our candidates in the regard. I completely agree with Locke (and Jefferson and Madison) that the job of the magistrate is not to save souls but to keep the peace. Religion should not be even in mind of an immigration magistrate. Thanks again for making my argument for me. The civil magistrate is suppose to ignore terrorists? He is suppose to help people entering our country illegally AND buy their votes by putting them on the dole? What you are voting for is sick, and your glib defense is just disgusting. I agree that my arguments would be illogical and devoid of reason if I were actually making any of the ones that you are talking about. Again, who is advocating open boarders? I don’t know anything about the complexities of immigration policy (and I suspect you don’t either), but someone who is expert in such things might make a good argument against actually letting anyone into the country, or they might just advise allowing in a certain number of rocket scientists with a certain net worth, or make a moral argument in just letting in the most desperate refugees of one kind or another who have small children, or a geopolitical and strategic argument that we need to help unburden our most important historic allies from a global humanitarian nightmare (which we helped create) by vetting and letting in some of the refugees flooding into Europe out of certain war torn countries. I honestly don’t know, but, as I have said, people who are expert in such things need to be the ones talking policy makers into practical immigration strategies based on pragmatic concerns that do not undermine our Constitution and our basic values. And there is nothing unconstitutional or immoral about keeping out the known or suspected pirates and “slavers” (which sounds humorously 15th Century by the way), or even known or suspected terrorists. The practical problem with the “Muslim” part is how does one know someone’s religion – are you just going to ask the would-be terrorist and assume that he is degenerate enough to blow himself up to kill innocents, but you don’t really think that he is willing to lie about his religion? The practical problem with not searching the persons and bags of the little white grandmas is: Where do you think the next terrorist is going to hide the bombs and guns if you don’t? Really, you are obviously far too compassionate and rational not to see how emotional and silly this whole argument is. This also is not an insult; it’s a compliment and a respectful appeal. BTW, yes I read Locke a long time ago. You do realize that your last paragraph just helps make my case? Thanks. You are being disingenuous. You don’t know the subject, but you do know the subject. Tom is wrong, some how. You are not for open borders. No. Not you. You don’t vote for people who are for open borders. No. Not them. Yet our borders are so well enforced that even children can cross them illegally. ISIS is practicing Muslim warfare the way Muslims have practiced it for over a thousand years. They don’t build concentration camps. They just chop off their heads or enslave their victims. And yes, they lie. Their holy book says that to further their cause they should lie to infidels. That’s why we probably should not be accepting immigrants from countries that harbor terrorists, which these days just happen mostly to be Muslims. You want to help those people? Then why did you vote for Obama? I am all for compassion, but self-destructive behavior is not compassionate. We love our neighbors as we love ourselves, not more. We give our lives for wives and our children. You think Locke makes your case? The Europeans had to fight to keep the Turks out. The Battle of Vienna took place in Vienna on 11–12 September 1683 after the imperial city of Vienna had been besieged by the Ottoman Empire for two months. Eastern Europe was busy kicking out the Turks well into the 20th Century. Read my post again. Nowhere in my comment did I condemn you as either a bigot or a hater. Such venting of my spleen in condemnation of condemnation would seem sort of self defeating don’t you think? What I am instead asking is that “we all” turn away from hate and condemnation and turn towards love. It is a respect and love filled request for a change of focus for “all of us” away from darkness of hate and toward the light of love. Why you want to continuously confuse an appeal to love as an attack on you or conservatives is an amusing mystery to me, but I’ll give you points for consistency. You give Democratic liberals far too much credit if you think that they are the exclusive party of love just as you would discount the compassion of Republican conservatives (particularly Christian conservatives) if you allow them to be accepted as the exclusive party of hate. A reverence for loving ideals such as pluralism, racial and ethnic acceptance, and freedom of conscience are “American values” that have been common to both parties and to both ends of the political spectrum as well as to Americans of every religion during the best of our history. I “gush love”? Thanks, I guess, but nothing is so easy as to be “all there is to it”. Love is hard work, much harder work than hate. But I think for those who want to do it, but I would think that hate is far more soul killing and exhausting in the end. The Constitution is about as American as it gets. Unfortunately, it is becoming American to ignore it. Agreed, in so far as crafting an immigration policy that discriminated based racial, ethnic or religious classification would indeed be ignoring the Constitution. I have no argument against being practical. However, as Christians I believe are principles are forged by love. As Americans, our constitutional principles are also based upon pluralism. Such sets of principles mean that we take risks for the sake of those values. For example, suppose a Christian religion firmly believes that our Constitution should be changed so as to allow a Christian theocracy which would impose their denomination’s form of Christianity upon all citizens. Even having that religious beliefs are protected under the constitution as long as that religious person or group do not break any laws or do anything unconstitutional in trying to implement that belief system. Even dumb, potentially harmful and hateful religious beliefs are protected just as the loving ones are protected. The Constitution requires that we not only tolerate but even defend against unlawful persecution of a belief system even when that system runs contrary to our constitutional values. Certainly immigrating citizens can be asked to take an oath to defend our Constitution, but don’t you think that using an assumption that they cannot do that simply because they are Muslim and therefore to discriminate against them based on their religion is antithetical and self-defeating of the vary values that we seek to protect? That’s not an accusation. It’s a question. We have borders around our country for the same reasons we put fences around our yards. The borders help us to maintain order and control. We have a government because gushing love doesn’t keep fanatics, thieves, and slavers from cutting your throat or binding you in chains. When religious fanatics or just plain evil men are willing to sacrifice the lives of others on the alter of their God or their greed, if we love our families, friends, and neighbors, we don’t gush love at those fanatics. We cleanse the world of them, and we keep the societies that routinely produce such fiends away from our families, friends and neighbors. As James Madison observed, we are not angels. Hence we need a government. The problem is that because we are not angels we even have a problem keeping the people who run our government from abusing their power. We also have a problem keeping ourselves from using the government to enrich our own pocketbooks at the expense of others. You are ignoring all such problems. Why? I don’t actually know. Your explanation is too illogical and devoid of reason to take seriously. I suggest you read “Two Treatises of Government” by John Locke. During Locke’s time, the Protestants were concerned about the intolerance of the Catholic Church. You may recall how the Spanish Armada attempted the invasion of Britain. It took quite awhile for the Catholic Church to accept the notion of religious freedom, and it took some time after that for Protestants to believe that Catholics had conceded the right of religious freedom. “A Letter Concerning Toleration” (https://en.wikisource.org/wiki/A_Letter_Concerning_Toleration) by John Locke addresses the issue if religious tolerance directly. In another part of his letter, Locke makes the point the duty of the civil magistrate does not concern the care of our souls. Please consider his logic, and consider carefully the sort of civil magistrate you are giving your vote. If you don’t think you are trying to force your religious beliefs on others, you are just kidding yourself. With all due respect Tom, please do not pretend that this is any kind of real response to my appeal to start a less caustic, more charitable discussion of the two major candidates around the concept of Christian love by balancing the proven positive virtues (verses their vices) of the two major candidates against each other. This rather extended manifesto instead seems to be your attempt to reframe the discussion that we actually were having (or at least that I was trying to have) and to mischaracterize the statements that I have made into the opposite side of the argument that you would like to have. This is fine, except that, as I have often said, I’m not really interested in debating collectivism verse individualism. I think both arguments, if carried out to the logic of their ideological extremes, lead nowhere that any sane American wants to go or live. Please don’t mischaracterize me as standing either in favor of or against any of this. In fact, if I’m against anything you said, I’m against the whole argument to begin with. If I’m for anything here, I’m for Americans to turn away from this exclusionary dark hatred that seems to be spreading like a shadow on our politics and turn instead again toward our “better angels” in the openness of love, compassion and hope. From a very general and pragmatic point of view, I think that America has always worked best as a positive and pluralistic slow “melting pot” rather than a stew. Everything adds a flavor, but eventually over time, it all becomes one raucous and sometimes spicy broth. This pluralism requires acceptance, openness, love and understanding, colorful diversity united by a dream that our best most universal virtues will lead a people of all races, faiths and ethnicities to a common pursuit of life, liberty and the true happiness that can only come from honoring and living such common virtues. We need to stop always looking in fear and hatred for boogeymen everywhere and in each other, and start acting with a virtuousness that comes from loving one another, and for us Christians, from seeing Jesus in every stranger, be they Muslim, Black, Brown or Samaritan. Yes, that involves openness and openness involves risk. But where did Jesus ever say that following Him in love and compassion would not involve risk? At some point a Christianity that walls itself in from other cultures and religions out of fear and hatred simply ceases to be Christlike; it ceases to be Christianity at all. As I said, Multiculturalism is a dumb excuse for calling someone a bigot. Any time a Conservative rejects something a Democrat wants, he is painted as a bigot. You have yet to justify anything. You gush love, and you think that is all there is to it. So there is nothing to debate. I can defend myself, but I am not perfect. And if I make one mistake or actually do something wrong, you will feel justified. Yet you call me the hater. Let me make clear the sort of objections you have ignored. 1. Illegal Immigration: We have millions crossing our border illegally. The numbers are such that we are being balkanized by language. In the past, many immigrants, because they had trouble assimilating and finding a job, would leave. Now we put them on welfare. Giving immigrants welfare and their children a free education make no sense. If you want to help people, help them in their own countries, and use your own money. 2. Encouraging immigration from Muslim countries is just asking for trouble. Islam is a political and religious ideology. The political part Islam is not at all compatible with our Constitution. That’s illustrated by an easily observed fact. Nations that are composed predominantly of Muslims tend to be tyrannical and have problems with terrorism. When we have military forces (Christians) in their countries, they want us to hide our Bibles and crosses. Freedom of religion is supported by Islam. 3. There is no question H. Clinton lied about what happened in Benghazi. There is no question H. Clinton had a private email server with classified information on it. There is no question Bill and Hillary have received large sums of money from special interests who seem to have gotten special favors in return. Why should we ignore those scandals and all the other scandals associated with that pair? We electing H. Clinton to public office, not asking her to join our church. 4. When somebody spends another person’s money on a third party, that somebody is not likely to spend the money wisely. If that somebody used the threat of force (taxation does involve that), abuse of such power is likely. Since redistributing the wealth is stealing to start with…..
5. The welfare state is destructive to the people who become dependent on it. Until the advent of the welfare state, blacks families included fathers. For the most part, that is not true anymore. Fatherless homes tend to lead to poverty and other problems. Instead of making things better, redistributing the wealth leads to dependency.